A Reliable Dumpster has been serving the Omaha, NE area since 1998. At A Reliable Dumpster, we take pride in living up to our name by offering disposal services and dumpster rentals that you can count on. Whether you’re moving or your business is in need of some intense cleaning, A Reliable Dumpster will find the right size dumpster rental for you. From bin rentals in Omaha, NE to debris removal, A Reliable Dumpster will be there for you to assist you with any of your dumpster needs. Since 1998, A Reliable Dumpster has been offering dumpster and bin rental services that live up to our name. You can count on us and on the products that we offer. At A Reliable Dumpster, we not only offer a wide variety of dumpster and bin sizes for you to rent to ensure that you have just the right one for whatever your project needs may be, we also offer dumpsters and containers that are of superior quality. We only offer dumpsters that are built with full metal frames to ensure safety and easy clean up. We have just the right-sized bin rental for whatever your needs may be. We offer both pick up and drop off dumpster, bin and container services. A Reliable Dumpster is more than happy to work with your schedule for dumpster rental deliveries and pick-ups. 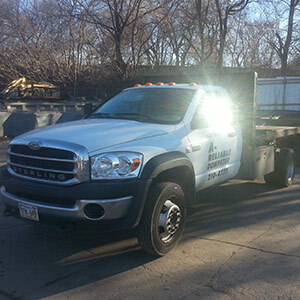 We are one of the most popular choices in Omaha, NE for dumpster rentals. A Reliable Dumpster serves Omaha, NE and the surrounding areas, within 25 miles. "Quick, cheap, reliable and friendly. I will use their services again!! Highly recommend!" "We have rented from this business twice now and have had nothing but positive experiences. The owner is very prompt with communication, ther..."
"I run several companies that require dumpsters all of the time and I was calling around the other day to find a company. Shane was the only ..."
December 8, 2016 Steve C.
"I call A Reliable Dumpster anytime I need a dumpster! This is a great company with a great owner that goes out of their way to help you!" November 15, 2016 Ryan K.
"I definitely recommend A Reliable Dumpster. This is one of the best dumpster services you can get at a good price!"